We at Param Enterprise based in Rajkot, Gujarat, India are leading manufacturer, wholesaler, supplier and dealer of Star / Universal Brand big size Political World Globes or Earth Globe approved by Survey Of India. 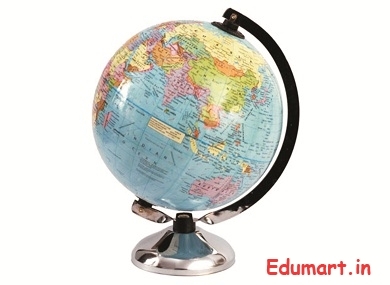 These World Globes 30 cm / 12" are used for a variety of purposes, as a teaching aid for classroom instruction of subjects like geography or social science, fun hobby projects to handsome home and office displays. Educational Rotating Geography World Globe is must for all educational institutes from class 3 through college. A World Globe is a 3D scale model of earth. It is also called as a terrestrial globe or Geographical Globe. This World Globe Contains all the country names and distinctive political boundary markings. Countries are highlighted using vivid colours so it is easy-to-find geographic locations and accurate placement of countries according to latitude and longitude. Plastic Educational World Globe is laminated with waterproof plastic film for their easy cleaning and mark / scratch proof surface. Time scale with 12 hour format is provided. Educational World Globe is mounted on a durable metal arc and base. This World Globe is available packed in multi colour printed cardboard box. This big size World globe is available in English as well as Gujarati language. Please search on this site for other available sizes medium : 8" / 20 cm and small : 5" / 12.5 cm. You can order and buy - shop online this Geography World Globe here!